Mountain Lion, Hogs, Birds and many more species in the west Texas region. We can accommodate anyone wanting to book a hunt including youth hunters up to larger corporate groups. Combo hunts and packages can be created to suit your needs. 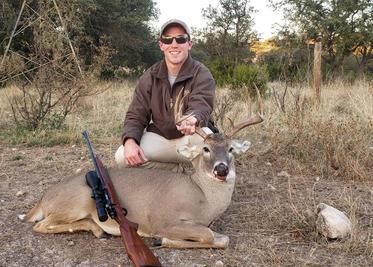 I Michael McKinny outfit hunts across the majority of west and central Texas . The operation I run is straight forward, no hidden fees or charges, and to the point. My hunts are run on properties that I have exclusive access to. I specialize in free range hunts for native and exotic species. My guides and I do this for the love of the sport. You will find that we are very respectful, laid back, and easy going. Yet when the hunt starts we will do whatever it takes to get you your trophy. Success rates remain at nearly 95% on guided and 80%+ on self guided hunts . wanting a guide. We also offer season leases on occasion. We are set up for the single hunter or larger corporate groups wanting an extended stay. Pricing and hunts are specific to individual ranches and are located on the left hand side of the page. who enjoys just being “away from it all” this is the place for you. quality animal. My guides are the best around and will do whatever it takes to give you a quality experience. We are very safety minded and hunt fair chase. or (915) 328-0645 Mike McKinny during regular business hours. We are often out in the field working or guiding so please allow 2 to 3 days for a response.